The history of luminous efficacy in different types of lighting shows the rapid improvements in white LEDs. The years in which the white light sources were developed are also shown. Credit: Yukio Narukawa, et al. (PhysOrg.com) -- Researchers from the Nichia Corporation in Tokushima, Japan, have set an ambitious goal: to develop a white LED that can replace every interior and exterior light bulb currently used in homes and offices. The properties of their latest white LED - a luminous flux of 1913 lumens and a luminous efficacy of 135 lumens per watt at 1 amp - enable it to emit more light than a typical 20-watt fluorescent bulb, as well as more light for a given amount of power. With these improvements, the researchers say that the new LED can replace traditional fluorescent bulbs for all general lighting applications, and also be used for automobile headlights and LCD backlighting. The Nichia researchers, Yukio Narukawa, et al., have published the results in a recent study in the Journal of Physics D: Applied Physics. The team fabricated three types of high-luminous efficacy white LEDs, each of which utilized a variety of improvements in device structure to improve their luminosity, or brightness, and reduce their operating voltage. The researchers focused on two measurement criteria. One was luminous flux (measured in lumens), which measures the light's luminosity as perceived by the human eye, whose sensitivity varies for different wavelengths. The second criteria was luminous efficacy (measured in lumens per watt), which measures the amount of luminous flux achieved with a given amount of power. Briefly looking at the history of a few different types of light sources helps provide some context for the LED's recent rapid progress. The incandescent bulb, which was developed in 1879, had an initial luminous efficacy of 1.5 lm/W, which improved to 16 lm/W over the next 130 years. 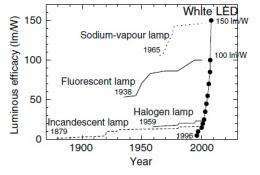 Fluorescent bulbs, first developed in 1938, achieved a luminosity increase of 50 to 100 lm/W over the next 60 years. The progress of white LEDs is much more pronounced: since their commercialization in 1996, white LEDs' luminous efficacy has increased from 5 lm/W to today's commercial white LED of 150 lm/W, the highest luminous efficacy of all white light sources. The theoretical limit for white LEDs is about 260-300 lm/W. Now, the Nichia researchers have taken the white LED's luminous efficacy a step further, achieving values as high as 265 lm/W at 5 mA of current, or 249 lm/W at 20 mA, values that nearly reach the theoretical limit. However, the downside of this specific design is that the luminous flux is quite low, about 14.4 lm. By modifying the design, the researchers demonstrated two other white LEDs: one with values of 203 lm and 183 lm/W at 350 mA, and one (as mentioned above) with values of 1913 lm and 135 lm/W at 1 A. This last white LED was fabricated by connecting four high-power blue LED dies in series. The cross-sectional structure of (a) a conventional LED and (b) a new high efficacy LED with the patterned sapphire substrate and ITO contact as p-type electrode, which reduce the optical absorption and improve the extraction efficiency. Credit: Yuko Narukawa, et al. All three white LEDs are based on a blue LED die, which is coated with a yellow phosphor to achieve a wider emission spectrum. When blue emission from the LED die mixes with the yellow fluorescence from the phosphor, the device produces white light. Since the red part of the emitted spectrum was initially low, the researchers also added some red phosphor to enhance the red emission and create a more balanced spectra. Overall, the researchers noted that the color reproduction in this design is the highest of all white light sources. To optimize the luminous efficacy, the researchers focused on a key problem of LEDs: the electrodes tend to absorb some of the light that could otherwise exit the device and increase its luminosity. To reduce absorption at the electrode, the researchers used an indium-tin oxide contact as one of the electrodes, and also used a patterned sapphire substrate to scatter the light so that it could more efficiently exit the device. The researchers also optimized the device to reduce the operating voltage from 3.08 to 2.80 V.
With these design improvements and the resulting enhancements in luminous efficacy, the new white LEDs provide further evidence that solid-state lighting can meet a wide variety of our future lighting requirements. Narukawa said that, although these LEDs are expensive compared to commercialized LEDs, he predicts that the price will come down in the future. He also plans to further enhance the luminous efficacy of the white LEDs for general lighting applications. This is brilliant news. LEDs are finally starting to be compete against the technical strengths of both CFLs and incandescents. The only remaining hurdle (albeit a big one) is price/performance of the initial purchase, where LEDs still lag far behind. Can we make them totally directional and allow my children the chance to see the stars in their true glory? It's one of the things I miss most where I live. Most people go to Vegas to gamble, I go so I can hit the deep desert and see at least as far as a level 3 LPE will allow. @Skeptic_Heretic, star watching in the desert, very cool, I can only imagine the stars in all their unadulterated magnificence. If you haven't done it, do it as soon as you can. If you ever go to Australia or Morocco, those are the last places on Earth, outside of antartica that have regions of LPE 1 and 2. I'm thinking of going to Morocco next year for just this reason. Northern Canada and a few parts of Siberia are completely devoid of artificial lighting as well, but due to the high latitudes you can only see stars (well) for a few months a year, due to a combination of auroras and the midnight sun. And those times of the year are coooold. This is good news! I would love to replace all of my CFLs. I started with a plan to do just that but LED lighting was just not bright enough for my needs for half the house. So, half of the house is all LED. The other half is CFL or, as is the case for one room, tube flourescent. I also cut my electrical bills by almost 49% by replacing the lighting fixtures and lights. No fixture, with one exception, uses more than 24 watts. All bathroom and closet fixtures use no more than 8 watts each and the dining area chandelier uses only 16 watts. All LEDs are directional, which is why manufacturers have to add reflectors and various light-diffusing coatings or resin housings to make the light scatter for use in home and other lighting applications. As to star-watching, there is nothing that beats star-watching in the desert. I have found that Arizona in an area between Utah and Nevada is one of the best places. There's a beach in CA (I forget which) that provided stunning views also. I stopped buying CFL incand replacements. After going through a bunch of them over the past few years, my experience is they don't last longer than an incandescent type and the extra cost is completely unjustified, not to mention they contain mercury. It all depends upon the brand and upon usage, as well as the quirkiness of your supply power. I have had CFLs last for years. But, in one house I lived in I could count on replacing a CFL in the porch lighting fixture every few months. I've had them in another fixture in another home die in days, one after another. When I buy them now, I get the kinds with warranties. They are more expensive but they get replaced for free if they go out. Those ones typically last for several years. But, you are right about the mercury. I had the hardest time replacing my incandescents with those. But, electric bills went up enough to justify buying them. I save them in a sealed container when they die and when I get enough of them I take them for recycling. Depending upon where you live, there likely will be several centers where they can be recycled. Ikea stores recycle lights you buy there. Sometimes you can recycle other brands, too. If not, there are phone numbers one can call for info. An artist friend hated led lighting because the very specific light frequencies distorted colors (color rendering index). Probably was an RGB style bulb. Has anyone heard if Phosphor-based LEDs are accepted by light "connoisseurs"? Star-watching: Sounds like most of you guys are from the West coast, but take a trip sometime to Isle Royale; an island with (almost) nothing man-made on it in the middle of Lake Superior. Also a fantastic backpacking destination. CFL's: In my experience it is usually the electronic ballasts that fail due to overheating. Air convection is required to allow the heat out. LED's will have the same fate if the air is trapped in the fixture. CFL's often suffer from poor color reproduction. LED's again use similar technology to create white, so same issue. I also have electronic dimmers in my overhead lights at home and tried dimmable CFL's, but they seem to light erratically and have a mind of their own. Halogen's make the best color, in my opinion, and are most elegant with almost a point light source but are somewhat expensive, fragile and only marginally more efficient than regular incandescent's. I hope for them that it will not take too long to be used for products in the market. Meanwhile in Europe research for OLED lighting is ongoing in EU Seventh framework programme. As with any relatively new or up-and-coming technology, people have a tendency not to accept it. As to LEDs, all so-called 'white' LEDs are phosphor-based. The new Nichia LEDs described in the above article have promise in this regard. One thing I have noticed is that reading by LED light seems easier on the eyes if they are not too dim. Of course, that is anecdotal evidence so it may not apply across the board. From what I have noted, both CFLs and LEDs of the common variety interfere with color recognition of the eyes and with the color index. It is really hard to tell certain dark blues from black. But, again, the LEDs described above have the potential not to have this effect. I, for one, am looking forward to experimentation. Star-watching: Sounds like most of you guys are from the West coast, but take a trip sometime to Isle Royale; an island with (almost) nothing man-made on it in the middle of Lake Superior. I am using dimmable CFLs right now in a ceiling fan fixture. I hate them. Not only are they erratic sometimes, they stay dim for several minutes while they warm up. As soon as dimmable LEDs become bright enough these CFLs are gone. Hate to waste them, though. They have a 13 year warranty. On CFLs burning out, I actually had one have the ballast section melt a bit! As to star-watching, almost nothing beats doing it in the high deserts about between 4000 and 6000 feet up. There is considerably less atmospheric dust and smog particulates between you and the stars. But, that island sounds like a fun place to go, nonetheless. Well a lot of those bulbs are warranteed. I've had the quick burners replaced by the manufacturer at no cost, simply by going to the store I bought them from. As to your statement of mercury. If you live in the US, your power is certainly at least partially coal based, with very little exception. On a measly 10% feed from coal, using the lower wattage CFL actually releases less mercury in total than the incandescent due to the burning of coal and copious amounts of mercury contained therein. Beyond that you're using 30% less electricity or better, which means a lower electric bill over time, and less fuel burned at the plant. It makes sense economically, geopolitically, and environmentally. I read your link and I think you're ignoring the fact that all electrical current produces RFI, EMI, Dirty Electricity, and Critical Flicker Frequency. Unless CFLs have a dynamic, ie: balast design, the creates this in greater quantity, your statements are not necessarily pertinent. On your site you suggest that CFLs cause Migraines, Epilepsy, Multiple Sclerosis, Dizziness/Vestibular Problems, Seizures, Nausea, Cardiac Arrhythmias, Tremors, Anxiety/Panic Attacks, Fatigue, Autism, Head Pain, Acquired Brain Injury, ADHD, Scotopsia, Electromagnetic Field Sensitivity, Depression, Difficulty Concentrating, Pain in Teeth, Pain or Pressure in the Chest, Pressure In/Behind Eyes, Ringing in the Ears, Tingling, Shortness of Breath, Weakness, Spike in Blood Sugar, Diabetes (type A and B), CFS/Myalgic Encephalopathy, Photosensitivity (Critical Flicker Frequency), as well as Skin Rash, Lupus, Photosensitivity (medications), Fibromyalgia, Itching, and Facial Flushing. Perhaps, before you debate the topic, you could take time to review all of the data on the website. I've done so. None of your work states that CFLs CAUSE any of those problems. They may exacerbate these issues, but only in a very small percentage of the population. A percentage that is lower than the number of children affected by RHYS syndrome each year. The issues you attribute to CFLs are also expressed by all lighting aside from filament lighting, including television, movies, videogames, a snarky kid with a mirror, etc. You have no evidence for a lot of your assertions. "Dr. Kenneth Ciuffreda, of SUNY, has conducted some of the current research on CFF, as well. One of his papers is on the website, also." "It is obvious that you have not read the scientific studies by the prominent researchers on the website"
Where are these papers you talk about (esp. Dr. Ciuffreda). I used the search feature on your page, but was only given a reference to Dr. Ciuffreda's paper. If you have peer-reviewed published work at your website, make it easier to locate. My apologies if I missed them, but I could find no papers, just discussions of papers. @GJS, Found the papers in question. No reply to the above query needed. I read the papers and all the other information on the site. Moral of the story, at least so far as Dr. Goldsworthy is concerned: If you get symptoms, replace your CFLs with better quality CFLs. The study on CFF is interesting but not really applicable to CFLs since they do not flicker like tube flourescent lighting. LEDs also were used in the study! (Before you argue about flicker in CFLs you should read the material on your own site). Some of it clearly states that there is no flicker in CFLs, attributing possible symptoms to the magnetic fields generated by them. In that case, Goldsworthy recommends replacing them with better quality CFLs. Of course, he also recommends that CFLs be a stop-gap measure until LED lighting improves. That is also my stance. You should be aware that there is a kind of flicker with LED lighting as well but it is somewhat different. Most people cannot see it but I sure pick it up with my webcam. There also is EM radiation from LEDs as well. I am getting no noticeable difference in the life of a CFL compared to an incandescent and I've used them in many locations. The extra cost of a CFL doesn't even come close to justifying using it for a 30% power saving. I will buy the cheapest thing I can until LED lighting comes out. At least you can count on LED's lasting as long as advertised. Actually the parameters of these new LEDs aren't so brilliant. A cool white Cree XM LED driven at 350 mA can produce 160 lumens at 160 lumens per watt. At 2 A, an XM LED produces 750 lumens at 110 lumens per watt. If that is the case, it has to do with the brand of CFLs that you are buying. Alternatively, you are turning lights on and off all the time, which also will shorten the life of CFLs. LED lighting already is out in the market. I have installed it in as many places as possible in my home. I have just found some brighter lighting and may be replacing the remaining CFLs sometime this year. I don't know... New Nichia LEDs still look more efficient to me, and brighter, too. You think I have been looking at the brand when I bought these things over the years? You are at least partly right, how they are manufactured has a lot to do with their life and I would bet that any made in China will have little or no QC. Companies in THIS country have not always been careful about the gas in them and it affects the lifetime a lot. The black bands that you see at the ends are caused by cheap gas. When quality gas is used in a CFL the lifetime can be dramatically increased and you don't see the blackened ends. Sure they get turned on and off a lot, what lights don't? It shortens the life of CFL's as well as incandescent's. How many people you think dispose of CFL's properly? I worked in a shop for a few years with 8ft FL's. We were changing them out constantly. They all had a 2 inch black band at both ends when they went out. We bought all the major brands. One day a salesman came in and told us that those bulbs all had impure gas in them and that if we bought his with pure gas they wouldn't burn out so quick or get the black bands. We bought them and for the couple more years I was there we never changed another and they didn't get the blackened ends. The current compact CFL's that are made overseas are a scam. You can bet they have cheap gas and they are not meeting their potential or advertised average lifetimes. And here is an article about them, from of all people FOX. "As each CFL contains 5 milligrams of mercury, at the Maine “safety” standard of 300 nanograms per cubic meter, it would take 16,667 cubic meters of soil to “safely” contain all the mercury in a single CFL. While CFL vendors and environmentalists tout the energy cost savings of CFLs, they conveniently omit the personal and societal costs of CFL disposal." I only use Phillips and GE brands. I avoid Lights of America merchandise like the plague. CFLs are not meant for the bathroom, unless you get the sealed kind. But, if you do, look for bathroom rated CFLs that have at least an 8-year warranty. I used to buy them without checking the brand for a while, too. Then, I noticed that certain brands tended to perform much better than others and lasted longer. Nowadays, all 3 of my bathrooms have nothing but LED lighting with warranties for at least 8 years. I use no more than 8 watts a fixture. But, yes, mercury is a concern. I have a small, special bin in which to collect them, and when the bin is full I recycle them. I may not have to recycle any for a couple more years, however. There is no doubt that these lights are an environmental hazard. You should see how hazardous the materials used in manufacturing the next generation of solar cells are. A couple of them make mercury look benign by comparison. Skepticus_Rex: Indeed, the incredible amount of toxic waste produced during the manufacture of photo-voltaic solar panels (both in absolute terms and on a per watt basis) is something that PV panel supporters consistently ignore. And I can't for the life of me figure out why, especially when there are better, cheaper alternatives than PV-solar that are more likely to satisfy the "green" and "renewable" criteria (ie, wind turbines, in-river hydro (not dammed)). Follow the money. You will see that most of the biggest and most vocal pushers of so-called green energy are those who have invested quite a sum of money therein. Something else worrying to me is all the gases put out into the atmosphere used in the manufacturing and cleaning process of solar cells. These gases are many thousands of times more potent GHGs than CO2. Just wait and see what will happen when manufacturing gets a kickstart by all the demand forced by legislation. flourescents should NOT be used with regular dimmers! it may kinda work but it dramatically shortens thier life. The same is especially true of light-sensing switches that turn lights on at night. (and perhaps motion-sensing switches also) There are some dimmers/night switches that are special made for use with flourescents, but I dont know if they actually cause 0% reduction in bulb life. I'm assuming you don't promote LCD, Plasma, or OLED televisions or monitors in that case, seeing as NF3 is used heavily in the manufacture of those items as well. You would be correct. I do not own such a television device, either. When I find a brand that does not use one of these gases as part of the manufacturing process (or, at least works to attain near 100% gas recapture) and which is of good quality, that will change. But until then it is not likely that I will be purchasing one anytime soon--unless I am forced into it, of course. This is why you buy CFLs that are meant for dimmers. Always make sure you keep your receipt and the original packaging. The ones I bought are guaranteed for 13 years. If one goes out during that time I get a free, new one.